Which size is she wearing? Does he like rather longsleeve- or shortsleeve shirts? 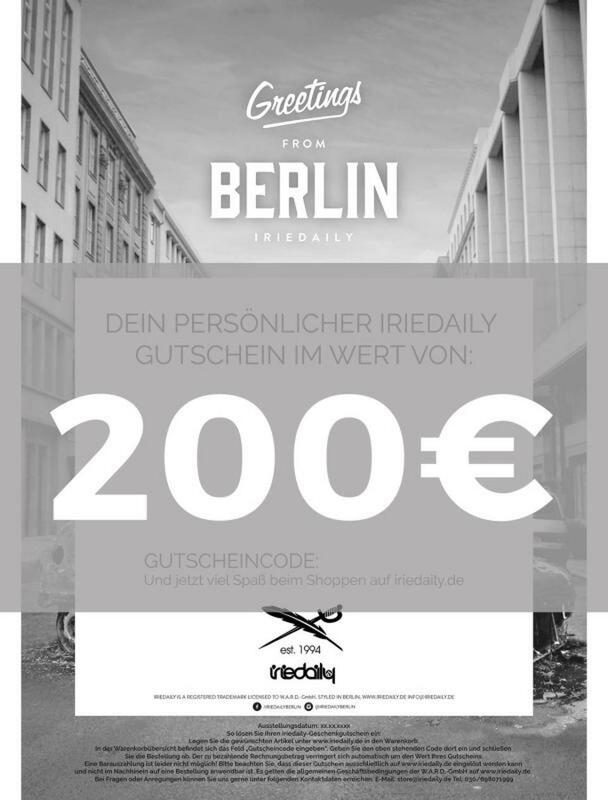 Let your loved ones decide for themselves with the Iriedaily gift coupon! Via Email (PDF): We send the gift voucher to the recipient via Mail (PDF)! Perfect when speed is important! You will get a copy to your Mail address as well. Of course you can also choose to send the voucher to your mail address, print it and give it to the lucky one face to face! Therefore just enter YOUR mail address in the field. By post: Everyone likes nice letters! We send out the gift coupon directly to the recipient! For free! Of course the recipient has to know who deserves the credit for the gift! Write you personal message for him which is shown directly on the gift coupon. Complete your order by giving the needed information on the recipient and pay the gift coupon. It is no problem to redeem the full value of the coupon on several orders. Just enter the coupon code on the second order again and get the balance discounted! It is not possible to receive a cash payment of the gift coupon value or any remainders.